Home Throwback Thursday	Hankerchiefs for Happy Tears! Greetings, Friends and welcome to Throw Back Thursday! Today I thought I’d share a few fun ideas my son and daughter-in-law used at their wedding reception. Come see their vintage handkerchiefs for happy tears! My son and daughter-in-law were married last November at Shirley Plantation in Virginia. It was a gorgeous outdoor wedding and reception. And because they had nearly a year to plan, they saw to it every detail was covered and executed! If you’ve planned a wedding recently, you know how many details there are! And then, just like that? It’s all over and they are married! But tons of planning goes into the big day! One of the ideas the couple liked was providing wedding guests with a vintage handkerchief. Not only would the hankies come in handy for happy tears, but also serves as a keep sake. So, once they decided to go with this, I volunteered to handle the hankie angle. My daughter in law wanted them all to be white and monochromatic so that was easy enough. I looked on eBay for bulk vintage, white handkerchiefs. I also scoured antique stores and consignment shops for an assortment of new and slightly used hankies. Naturally some were stained and beyond repair but others were simply wrinkled or had a spot or two. (Sometimes when you order on eBay in bulk you get a varied degree of conditions.) I found all different sizes and shapes of women’s and men’s hankies. My Dad still carried a handkerchief in his pocket every day so I looked for ones he favors. Once I collected enough hankies for the wedding, I washed each one in this special cleaner designed specifically for vintage and delicate linens called Retro Clean. Trust me, this cleaner really works! You can see how badly some of the old hankies are stained. I doubted they would come completely clean, but they did! A wash and overnight soak in the sun helps bleach the stains right out! After soaking the hankies overnight I washed them on the delicate cycle in my washing machine using my favorite linen wash. This detergent gently cleans and smells divine! I dried the handkerchiefs then ironed them on the linen setting using steam and spray starch. They came out clean and crisp. And looking brand new! My sister bought this pretty lot of hankies for me at an estate sale. I cleaned them all up but used only the all white ones for the wedding. I especially love the one with the bird since I had a blue parakeet when I was young. Carrying a hankie seems to be a lost art. My talented sister Stephanie, made the sign that said “Hankies for happy tears, please take one” using her Cricket machine and I put it in an ornate gold frame to go beside the hankie stand. To display the hankies I found this frame with wire at Michael’s Craft Store and used tiny white clothespins to clip the hankies to the frame. This way, guests could see all of the options and choose their own. We had the frame propped up on an easel with the sign beside on a table. 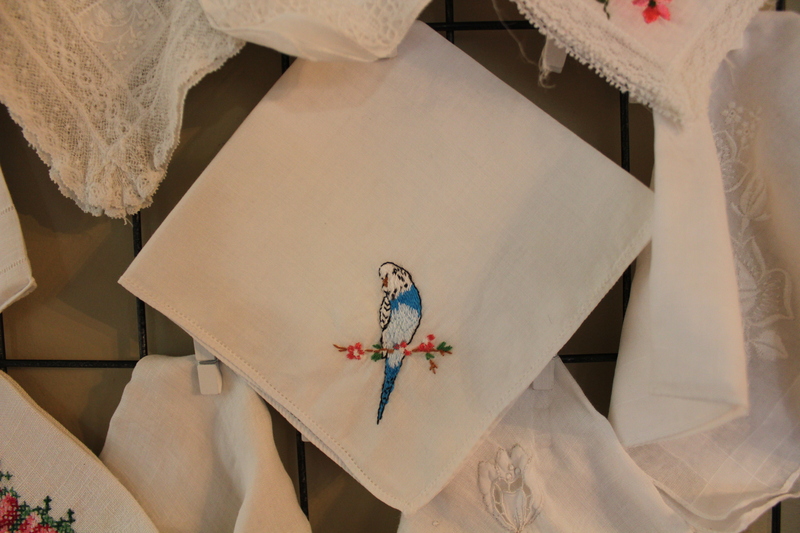 Some of the handkerchiefs had monograms, flowers or butterflies. Because my last name and maiden name begins with the letter B, I searched for lots of those. There were even a few that said, “Mother”. And trust me, the hankies came in handy! Here are a few of the men’s handkerchiefs with a “B” on them. I found a set of three brand new hankies at a consignment store for $2. I made sure my Dad got one of these. These are a few of the handkerchiefs I found. Each one is different and I love that someone lovingly embroidered them or sewed on delicate lace years ago. So pretty! The sky is the limit when it comes to wedding planning, decorating and all of those little extras that make your wedding even more personal and unique. Between all of the online companies such as Minted, Zazzle, Beau-Coup and eBay, you can find, order and customize nearly anything! And remember, time is your friend. When you order something personalized or monogramed, you really don’t want to pay for expedited shipping or a rush order. (and risk it not getting there in time) Also, take advantage of their great sales on the wedding websites (Like Zazzle) for invitations, personalized napkins or stir sticks. I saved between 25-40% off of napkins, invitations and stickers by ordering when they had their sales. You can save a bundle! How to Cook Perfect Pork Chops in the Oven!